I have been meaning to post this for some time as a description of my findings when making nic salts at home for the first time. but I have been prevaricating for a while and the BA took ages to arrive from Poland I will post each element of the process as I complete it. Tonight we are making and quantifying the Benzoic acid solution. The process is pretty simple but there is a bit of basic maths involved and of course you need VG and or PG, nicotine in PG and of course Benzoic acid. Ok the baseline for this is the Juul patent which says that 0.3g of benzoic acid should be mixed with 0.4g of nicotine. This can be said to be 300mg BA to 400mg nicotine. I made a 10% BA solution in VG by mixing 10g BA with 90g VG. Heat was applied up to 55 degrees C and the mixture was stirred and shaken to dissolve as much as possible. Assuming that the specific gravity of VG is 1.25 (90g of VG is approximately 72ml) we then have a solution containing 138mg/ml Benzoic acid. Ok so left the BA solution overnight then reheated in microwave and shook for about half an hour. I’m currently waiting for that to settle out so that I can judge how much is in solution compared to yesterday. As I write it looks like it still hasn’t dissolved in the VG properly. I will wait and see and then possibly do another solution using PG instead. It’s strange because although BA is a substance which is said to have partial solubility it is supposed to dissolve well in both VG or PG. Ok so the heat worked and I ended up with a fairly thick creamy VG/BA solution. 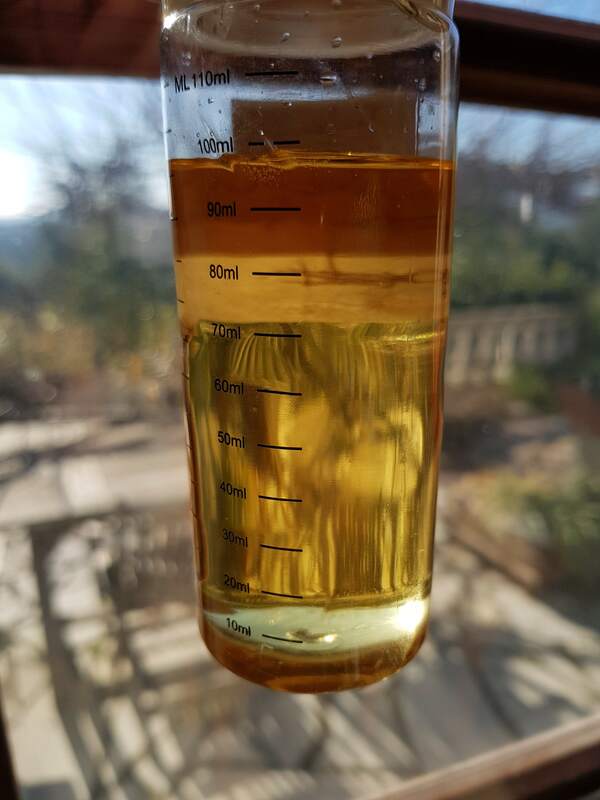 So we have a solution at 138mg/ml of BA solution which we need to mix with the correct proportion of nic solution to achieve a given nic strength in a salt form. I have 100mg/ml nic in PG. So in each ml of nic base you will need 0.544ml of 138mg/ml BA solution to get to the 3:4 ratio as required by the Juul patent. The 0.544 figure was worked out as follows 0.544ml of 138mg/ml equals 75mg of BA and 1ml of 100mg/ml nic base equals 100mg of nic base and 75:100 is a 3:4 ratio. AS it’s simpler to work out I am going to make 100ml of flavoured eliquid salt nic. 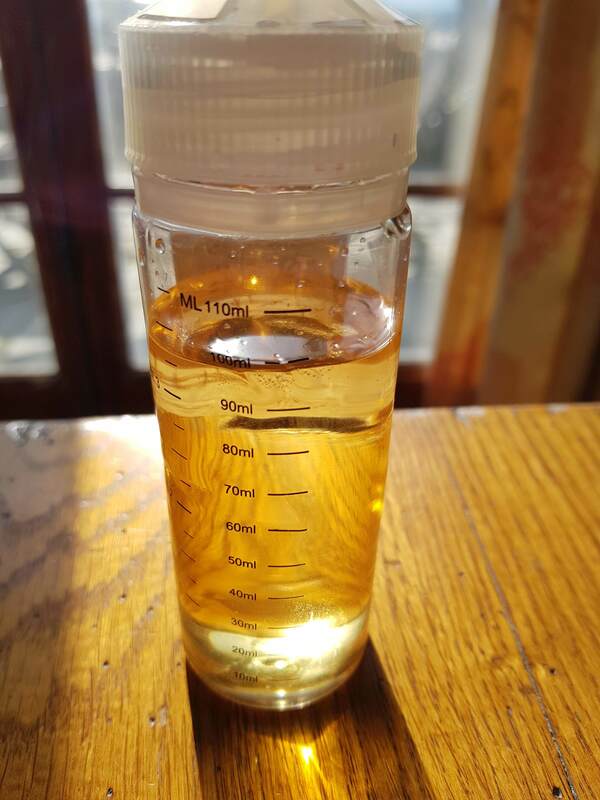 I put 36 ml of 100mg/ml nic PG base in a 120ml bottle (this leaves some shaking room). Then we need to add 36 x 0.544 which equals 19.6ml of the BA solution. Then we need to add PG , VG and flavouring to make it up to 100ml at the ratio of PG/VG we require. In my case I added 30.4ml of pure PG and then topped the bottle up to the 100ml mark with pure VG giving me a 50/50 PG/VG liquid. Oh and I forgot to add that about 10ml of my final PG was added via PG based flavouring to achieve 100ml of flavoured 36mg/ml nic salt liquid ready for vaping. Now it’s ready for a few weeks of steeping before I test it for the first time. This is the finished salt liquid with a 50/50 ratio and added flavouring. It’s a strawberry cream flavoured 36mg/ml salt nic eliquid 100ml. Hi Rofih Yes it worked out very well and yes the vape is smooth. Tastes slightly different to a flavoured liquid with freebase nic but nothing unpleasant. I’d recommend trying it. Just follow the ratio and make sure your BA dissolves completely in you BA solution before it is mixed to make the salts. I’m using it in a rota and a vladdin re pod but it is perfectly fine in an mtl tank. The thing about high mg salts is not to ingest too much. I know others who use 50 mg salts in various devices and just take smaller/fewer puffs when necessary. For me though this defeats the purpose as the salt nic is supposed to be used in mtl devices that don’t produce much vapor in order to keep you satisfied in difficult/stealthy situations. Well thank you. This was the whole purpose of making my experience public and a one nic base does all approach is much better for stock control IMO. Glad it has helped somebody.